The CopyBox 3 "Pro" is a stand-alone Blu-Ray duplicator which offers several special duplication functions. The unit has one Blu-Ray reader, three Blu-Ray writers and also also includes two USB data ports on the front of the controller. The CopyBox 3 Pro Blu-ray can simultaneously create three copies (BD-R or BD-RE) of a Blu-Ray master disc. Next to recordable Blu-Ray, the CopyBox can also duplicate CD and DVD recordable discs. The CopyBox Pioneer Blu-Ray writers are able to duplicate M-DISC recordable DVD's and BD's. These special archiving discs preserve your valuable data up to 1000 years. An internal hard drive can be fitted as an optional extra. The internal hard drive can store CD/DVD/BD images. Once copied to the hard drive, master discs are no longer required for duplication. The main advantage when duplicating from the internal hard drive is the maximum reliability; read errors are eliminated. Operating the CopyBox 3 Pro Blu-Ray is quite simple; all functions are selected using the LCD display and control buttons on the front of the unit. The system operates stand-alone and does not require any software or PC connection. This makes the CopyBox suitable for all users. Data is duplicated directly from USB stick (or memory cards using an optional adapter) to CD/DVD/BD disc. This functions allows multiple source USB sticks to be copied to one multi-session disc (append copy). Data is duplicated directly from USB stick (or memory cards using an optional adapter) to another USB stick. This functions allows multiple source USB sticks to be copied to one USB stick (append copy). Data is duplicated directly from CD/DVD/BD to USB stick (or external USB hard drive). This functions allows multiple source CD/DVD/BD discs to be copied to one USB stick (append copy). - Stand-alone duplicator for Blu-Ray, CD and DVD recordable discs. - Two USB data ports for special duplication features. - One high quality Blu-Ray reader, three Blu-Ray writers. - Optional internal hard drive for storing disc image files. - M-DISC archival DVD and BD support. - Maximum 12x Blu-Ray copy speed; a BD copy within 9 minutes. - All common recordable CD, DVD and BD disks are supported. 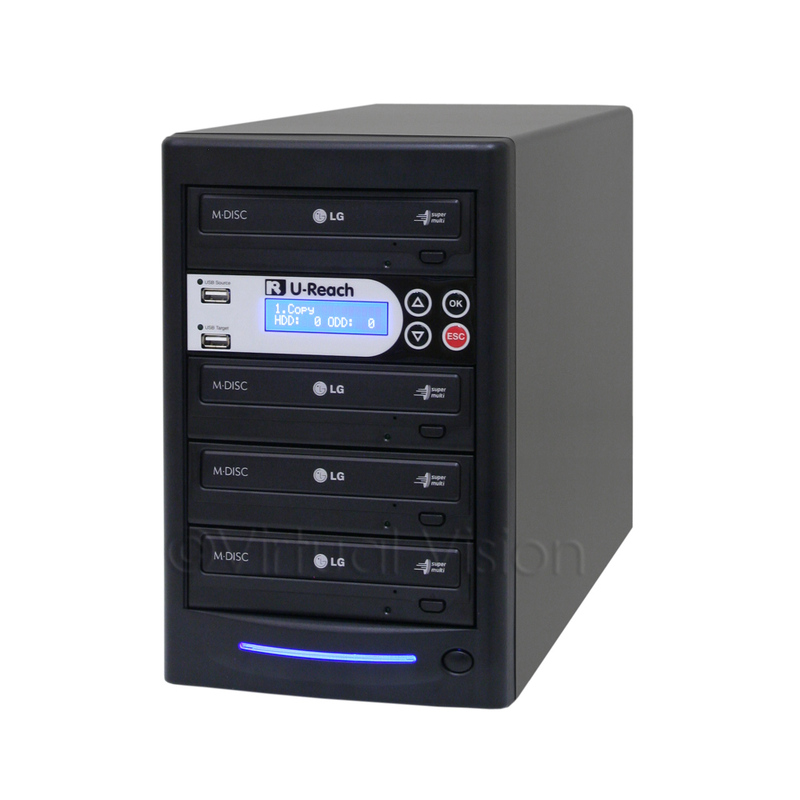 - Also available as CD/DVD duplicator. Warranty Standard	2 year carry-in warranty.